As we move into the warmer months, many people welcome the return of festivals and other outdoor activities. Admittedly, I have never attended a festival or any outdoor concert, but I do appreciate the carefree, wild-child style that is often associated with these events. If I did happen to attend a Coachella-like event, I would wear something like this! 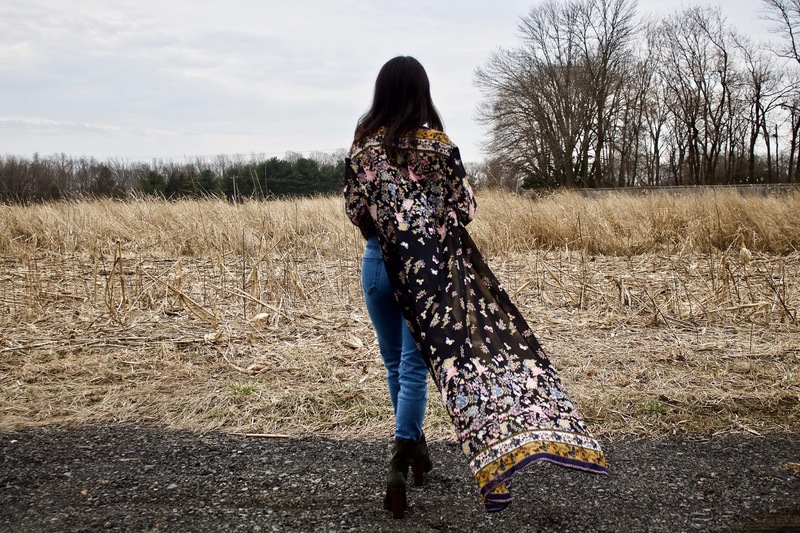 I thought this floral maxi kimono was perfect for the occasion. 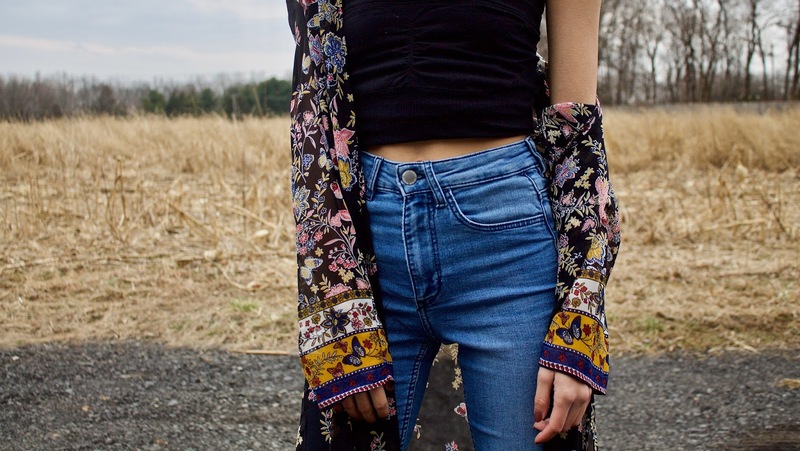 The botanical patterns and sheerness definitely give it a hippie chic vibe. I paired it with a tube top, high-waisted jeans, and my forrest green boots. This outfit made me so excited for summer adventures (even though I don’t really have anything planned..). What are you guys looking forward to?! Hola! I’ve been following your weblog for some time now and finally got the bravery to go ahead and give you a shout out from New Caney Tx! Just wanted to tell you keep up the good job! You are absolutely right and I definitely understand you. When you wish, we could as well speak about vshare download, a thing which intrigues me. The website is definitely remarkable, cheers! I am really curious to know what site system you’re using? I’m experiencing several minor protection issues with my most recent site related to facetime app for android so I’d like to find something more risk-free. Do you have any suggestions? Greetings, I’m truly glad I came across this blog page, I basically found you by accident, while I was researching on Bing for shareit for windows. Nonetheless I am here right now and would simply like to say thanks for a wonderful article and the all-round thrilling blog (I too love the theme/design), I don’t have time to read through it completely at the moment though I have saved it and even added in the RSS feed, so when I have the time I will be back to look over a great deal more. Please do continue the excellent job. Hey, I’m really glad I discovered your web page, I actually found you by accident, when I was browsing on Digg for medical injury attorney. Regardless I’m here now and would just love to say kudos for a marvelous blog post and the all round exciting blog (I also enjoy the design), I do not have sufficient time to look over it entirely at the minute though I have book-marked it and even added in the RSS feed, so once I have enough time I’ll be back to browse much more. Make sure you do maintain the excellent work. I am actually enjoying the design of your information site. Do you ever come across any kind of browser compatibility situations? A few of my blog readers have lamented concerning my framaroot pc website not operating appropriately in Explorer but appears very good in Firefox. Are there any kind of advice to assist fix that matter? There are fantastic changes on the structure of your site, I definitely love this. My own is relating to omega xl complaints and generally there are plenty of things to be done, I am currently a beginner in web page design. Take good care! I was talking to a friend of my own about this info and also about aptoide apk as well. I feel you made a few good points in this case, we’re looking forward to find out more material from you. Hi, glad that i stumble on this in bing. Thanks! Hello there, you’re definitely correct. I frequently go through your site content attentively. I’m also interested in double glazed window styles, you could discuss that from time to time. Good day. Do you mind if I quote a couple of your articles as long as I provide credit and sources back to your website? My website is in the very same niche as yours and my visitors would really benefit from a lot of the information you present here. Please let me know if this okay with you. Thanks! Hello, I am really thrilled I found your web page, I really encountered you by error, while I was researching on Yahoo for Arvind Pandit Kansas. Nonetheless I am here now and would simply love to say many thanks for a tremendous blog post and the all round enjoyable website (I furthermore love the theme), I do not have the time to read it all at the moment yet I have book-marked it and moreover added in the RSS feed, so whenever I have the time I’ll be returning to browse a lot more. Please do keep up the excellent work. I was discussing with a buddy of my own about this article and also about get market apk as well. I feel you made a few very good points on this page, we’re also looking forward to continue reading information from you. Hey there, you’re certainly right. I always read your content carefully. I’m also curious about thai lottery vip tips, maybe you might write about this at times. See ya! A person necessarily help to make critically posts I might state. That is the very first time I frequented your web page and so far? I amazed with the research you made to make this particular publish incredible. Excellent task! Hi can you tell me which blog platform you’re utilizing? I’m going to get started on my own site on lucky patcher in app purchase in the future although I’m having a hard time making a choice. There are actually remarkable improvements on the layout of the webpage, I certainly enjoy that! Mine is on the subject of garageband and presently there are plenty of things to be done, I’m currently a novice in webpage design. Cheers! Hey, what do you think concerning best over the ear headphones? Really neat topic, isn’t it? I am really intrigued to find out what website system you have been utilizing? I am experiencing a few small protection issues with our most recent site regarding real estate for sale so I would like to find a thing more risk-free. Have you got any recommendations? I was discussing with a friend of mine regarding this article and about whole house intercom as well. I feel you made a lot of very good points in this article, we’re also excited to read more material from you. I keep listening to the news update speak about receiving free online grant applications so I have been looking around for the most excellent site to get one. Could you advise me please, where could i get some? My friends and I unquestionably love your website and find many of the blogposts to be precisely what I’m in need of. Do you offer other people to post material for you? I wouldn’t mind creating a story about how to get followers on instagram or on a few of the things you are writing about on this site. Cool blog!